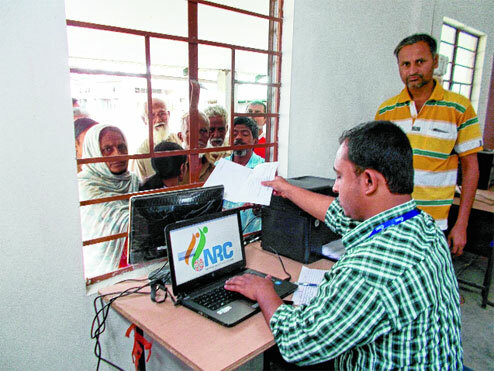 Dispur has sought 150 additional companies of security forces from the Central government to deal with any possible law and order problem following the publication of the final draft of the National Register of Citizens (NRC). According to a The Assam Tribune report, the Government has also sought the help of the North East Space Application Centre for proper mapping of the char lands so that the policing in such places can be improved. Special Director General of Police (Special Branch) Pallab Bhattacharyya said that the Centre is also closely monitoring the situation and the State government is expecting extra forces whenever required. “We hope that the Centre will take a call on sending extra forces whenever the situation demands,” the newspaper quoted Bhattacharyya as saying. The Centre has already deployed 85 companies of forces to be used for the process of updating the NRC to ensure that no law and order problem crops up in any part of the State. The State Government has sought 150 more companies of forces to deal with any eventuality after the publication of the final draft. The final draft was to be published on June 30 but it may now be delayed by a few days because of floods in some districts. Teams of senior officers headed by the Chief Secretary and Director General of Police have already held two meetings with the Deputy Commissioners and Superintendents of Police of different districts in Bongaigaon and Mangaldai to review the situation and the next meeting is planned in Nagaon on June 22. The plan is to cover all the districts before the publication of the final draft of the NRC. Bhattacharyya said that the vulnerable districts have been identified and extra precautionary measures have been taken. A few lower Assam districts and the central Assam districts of Morigaon and Nagaon are considered vulnerable and efforts are on to launch awareness drives not only in those districts but in the entire State.